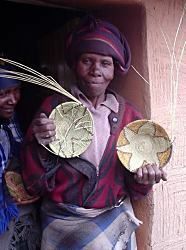 Kopanang Basali Basket Weavers, Litsoetseng area, Thaba Tseka, in Lesotho. In the remote and mountainous district of Thaba Tseka, three groups of village women produce exquisite liroto (baskets) made of local grass and natural dyes. Although their work is beautiful, they face challenges selling their baskets as they live in an isolated area of the country, a difficult two-day journey to the capital city Maseru and several hours' walk from a road with public transportation. The basketweavers are always invited to the agricultural show in Thaba Tseka. 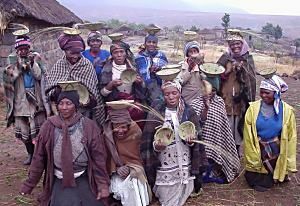 The women also bring the baskets down to Maseru to the Basotho Hat on their own. Ideally, the women are looking for more permanent sales connections. One group, Falimehang Kopanang Basali in Ha Maboloka Ha White II, began in 1963 when a woman who married into this village, Mme Tsebo Lerotholi, organized some women and taught them how to make Basotho hats and taught them baking, tie dye, knitting and crocheting. The group began with 10 women, but they have now all passed away. Luckily, some of their daughters in law volunteered to join the group. They then proceeded until the 90s alone without any outside assistance. Some Basotho traditionally wove baskets, but it is not very widespread. An old Xhosa woman in the village, named Macesoa Kholombile, taught the women how to weave baskets. In 1965 she began teaching the women of Falimehang Basali to make baskets. She passed away in 1993. In about 1995, the US Peace Corps sent two women to work with the women in Ha Maboloka. The Peace Corps Volunteers believed that the women of Falimehang were doing worthwhile work and they suggested that the other villages in the Litsoetse area join them to learn similar skills. Thus, Falimehang Kopanang Basali was the tap root organization in the area. The Peace Corps Volunteers were the first people to bring the baskets to the Basotho Hat (a retail shop) in Maseru. Now the villages of Ha Lekholoane and Bochletsane also have women's associations called Kopanang Basali. They are all loosely united. Although she no longer lives in the Litsoetse area, Tsebo Lerotholi continues to work as a liaison between the basket weavers and outsiders. She serves as a part-time director and consultant. She is the principal of Paray Primary School in Thaba Tseka (the largest town in the Thaba Tseka District). The women use wild plants to dye the grass. Even some of the purple dyes are made using a wildflower.